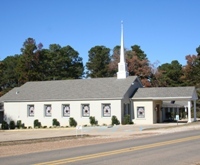 Fellowship Baptist Church was organized on July 1, 1848, with 18 members, three of whom were deacons. The first pastor 'Elias George' was called in that same year. The Music Minister is Donna Roberson & the Youth Directors are Kevin & Angela Manning. In 1850, the first church building was erected. The structure was 30 feet wide, 40 feet long, and 10 feet high. Cypress boards covered the roof and the floor was made of planks. Shortly after construction, the church received the title to the land on which it stood. The first Sabbath School was organized in June, 1879, and the first church literature was purchased in 1880. In 1887, a baptismal pool was constructed. On Sunday, June 5, 1918, a new auditorium was dedicated and in 1939, an educational building was erected. In that same year, Training Union was added to the educational program. The present auditorium was built in 1947, and new pews were installed in the early 1960s. In the summer of 1964, the church auditorium was air conditioned. The present baptistry was first used on January 28, 1964. A new educational building was dedicated on June 3, 1979, and the auditorium was renovated shortly thereafter. In 1986, new pews replaced those of the 1960s. The church purchased an adjoining 22-acre plot of land from Concord Association in December, 1983. Also included in church property is a 4.2 acre plot on which a pavilion and ball park were built. A new parsonage was completed in 1985. In May of 2011, an expansion of the sanctuary and foyer was completed. This expansion increased the size of the choir loft, and added additional seating for worshippers. Not only did the sanctuary get new pews and lighting, but the sound and video system was upgraded, and stained glass windows were installed. We all invite you to come and join us in our mission to please and glorify God as we "Turn Lives to Christ".